As I was accompanying my wife while she was writing her blog during the last long weekend holiday, I went through some TV series that I could watch via online streaming and I stumbled into this one. I remembered seeing a list of series that would be returning in 2016 and I read about this series with its premise of a team of geniuses that had to save the world. Sounds promising, right? So why don't we go direct to the series now? The pilot episode introduced us with a genius person who was working on some wireless problem in a diner named Walter O'Brien (Elyes Gabel - A Most Violent Year, Body of Proof TV series etc). The diner was a place that he would regularly goes where he noticed a waitress named Paige (Katharine McPhee - The House Bunny, Shark Night 3D and runner up 2006 American Idol) who was taking care of her quiet boy named Ralph (Riley B. Smith). After finishing his task, Walter got back to his garage and we would soon be introduced to his friends that consisted of the mathematician Sylvester Dodd (Ari Stidham) whom Walter often referred to as the human calculator, the mechanical prodigy Happy Quinn (Jadyn Wong) and last but not least a Harvard psychiatrist/behaviorist Toby Curtis (Eddie Kaye Thomas - American Pie series, Harold & Kumar series etc). All of them were actually geniuses with Walter being the highest having a 197 IQ. They formed a company named Scorpion which was supposed to be like a think tank and should be able to provide solutions to various matters. But instead they were unable to do so due to their low EQ and difficulty in liaising with people. A homeland security agent named Cabe Gallo (Robert Patrick - Terminator 2: Judgment Day, The X-Files TV series etc) who had a history with Walter, came and asked for Walter's help to resolve some problem with the L.A airport where their system crashed and had to be repaired to avoid disaster of many planes unable to land. Scorpion had to race against time against all odds to resolve it. And they would be assisted with the most unlikely help from Paige. I will leave the details on how they would manage to do it, but suffice to say, all the genius minds of Scorpion were put into good use. 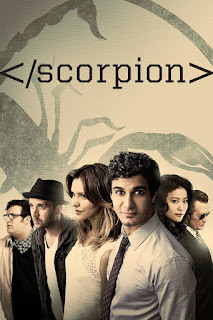 In future episodes, Scorpion would be working as independent contractor under Homeland Security with Cabe as their handler and Paige as their "PR" or Liaison for them. Their cases mostly would be having to deal with matters that would endanger the security of the country and world. Wow, I was totally hooked watching this series. Despite it was having 22 episodes for 1st season, I could not stop watching it and was able to finish it in 2 days during the holiday. Although it was not having a main arc story during the whole season, like Blindspot or Quantico, the chemistry of each member of Scorpion and the funny things happening due to their unique specialty (or mostly people would consider as geek) were interesting to see. The relationship between Walt and Cabe which was more than a decade was also fun to see. And of course Paige's character as the "glue" to the team was crucial and not felt forced at all. Each episode, would always deal with time sensitive matter where time was of the essence and we would be feeling the suspense of whether the case could be resolved on time. What I loved about the series was they were able to follow the timeline like when they said it's left with 1 minute, it really took 1 minute and so on. It was a bit like 24 TV series in this part. Another thing that I loved about the series was that each individual member was given a rather balanced share to show their abilities. Sylvester was shown to be able to give an exact calculation of probabilities and times, while Happy was able to provide her ability to use her mechanical expertise to create things out of nothing (kind of like female MacGyver) and even Toby was able to provide his insights of the possible culprit based on their behaviors. There were also lots of funny moments involving each person (I loved episode 14 which I laughed the most), dramatic moment (episode 12) and there were also some cheesy moments of course. There were episodes that were more serious as well such as episode 9, 11 and the last 2 episodes of season 1. Basically most of the episodes were interesting but I also think some things were a bit exaggerated, usually about their ability to perform various acts that would require physical actions. But then again, it did not hide the fact that the series was very interesting to see. I personally loved and enjoyed this one and could not wait to see the second season soon. So for those who are looking for a series where a team of geniuses would work together and save the country using their mind, then this series would definitely interest you. I would recommend you to try and watch this one at least see the first episode and see it before deciding. But of course if you are a firm believer of the critics' view, then you might doubt my views as the critics rating was not high. From what I understand, those that looked down on the series think that most of the things happening were not technically possible and so on. Now I am not a technical person and I never think whether those technical terms are correct or logical. Hey, if I want to understand that, I would be watching National Geographic channel or Myth Buster kind of show. From viewers ratings point of view, the series was having relatively steady number of viewership. So the choice is yours whether you want to see and enjoy it like lots of people did (otherwise it would not be continuing till 4 seasons and counting) or you want to just avoid this series entirely based on critics' view.